In the Performing Arts Center (PAC) lobby sat a group of students,all interested in the important message of spreading kindness. 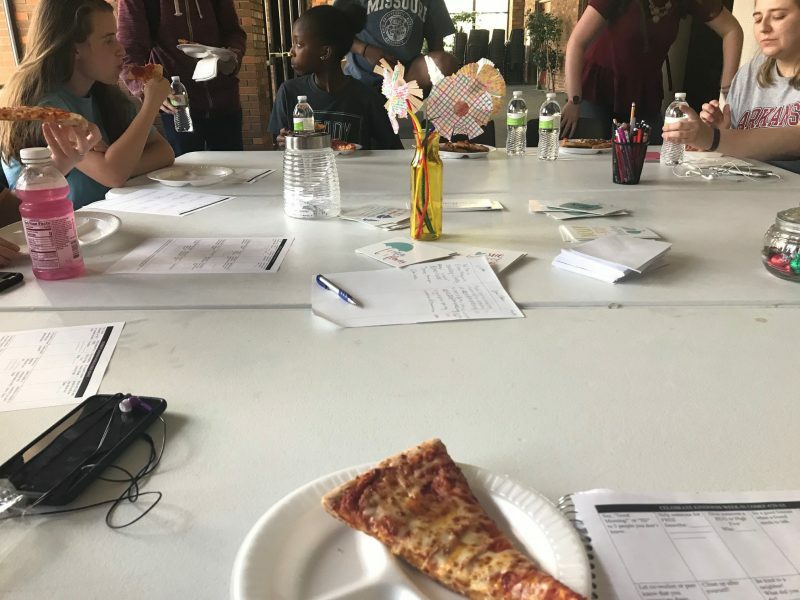 During both lunches May 1, outreach counselor Lesley Thalhuber, organized a kindness pizza party with one goal:to talk about the importance of kindness. This week of April 30 through May 4 is the national week of kindness. “More students should realize they have one superpower and that is to send kindness to others,” Thalhuber said. The pizza party was a creative way to allow students to sit down together and to share their thoughts about kindness week. With activities such as passing around a jar full of slips of paper giving ideas. Junior Emma Ragsdale is wanting to make it a priority to go the extra mile for others with activities that were suggested at the pizza party. “This lunch sounded like a great way to get the message out and to talk about being kind.” Ragsdale said. Ideas consisted of sending a thoughtful text message to even little things like opening the door for someone. Senior and youth kindness ambassador Yash Khanna, a volunteer along with other students here, sat and joined in on the lunch with fellow ambassador junior Madison Hopper. One thing expressed through the kindness pizza party was for students to recognize they can make a change and help others through their actions. There are many activities in the community to stay involved in spreading positivity, including volunteering with the Children’s Grove. A group that does community projects that show great examples of putting in time to others. “ A lot of us talk about the negative things such as bullying and being rejected but I want to do the opposite and talk about the positive to remember we all can make a difference,” Thalhuber said.